I created Rose’s Perfect Pie Plate to make shaping a border truly as easy as pie. The deeply fluted rim keeps the lovely design from flattening when baked and the level impression keeps the dough from sliding down the sides. We made this video to show you how easy it is to tuck the overhanging border underneath and then to press it down. If you want to have the baked border flush with the edge of the pie plate you’ll need to press it a little past the edge but i like to press it just to the edge so that when it shrinks a tiny bit you see the edge of the plate. The pie crust is my favorite: Rose’s Flaky and Tender Pie Crust—the December 2018 recipe of the month on this blog. It is made with butter and cream cheese which gives it a most delicious flavor as well as lovely texture. Our Weekly Baking Tips for Sunday will have 3 videos with tips for Blind Baking this pie crust for making Rose’s Open Faced Apple Pie. Blind baking gives the pie a very crisp crust but it is also excellent adding the apple slices to the unbaked pie crust, in which case I would choose to brush the dough with a thin layer of apricot glaze instead of egg white. My Chocolate Peanut Butter Mousse Tart, from The Pie and Pastry Bible, was the recipe Food and Wine Magazine selected for their annual book The Best of The Best. It also happens to be my favorite recipe from the book.Dear David Leite just posted the recipe on his blog to honor the peanut butter day (and me!). I hope you will try it and if not today, how about for Valentine's Day?! I once made it! in a heart-shaped fluted tart pan! 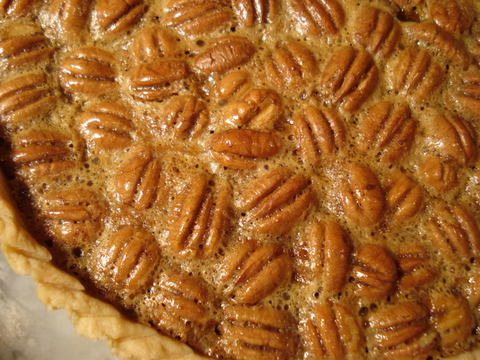 Here's what I just made--a pecan pie shaped in a tart pan (recipe in the Pie and Pastry Bible). And here are a few tips: Keep in mind that if there are any holes in the crust the sticky filling will find its way there, leak below the crust, and stick to the pan's bottom. To avoid holes best not to pierce the bubbles that form during blind baking, after removing the rice or beans to weight it down, but just to gently press down the crust a few times as it bubbles and finally it will set and be flat. Should a hole develop, fill it with a little dab of egg white and return it to the oven for about 30 seconds. And if worse comes to worse and the crust sticks, just serve the pieces--no one will complain. This pie is the very definition of heavenly! Be sure to use the Lyle's golden refiner's syrup which is so much more flavorful than corn syrup in a butterscotchy/tangy way, and preferably light Muscovado sugar (I love the one from India Tree). And be sure to weigh or measure the yolks. For this pie/tart that calls for 4 yolks I needed to use 6 to equal the right amount as they were so small. Without enough egg yolks the filling will not set effectively.] One last word of caution: When heating the filling go by the thermometer rather than looking for signs of thickening. And when baking test at 15 minutes. I find it usually takes 20 but it should just shimmy slightly when moved and begin to puff. It will be cake for New Year's but for Xmas week here's what I made and talk about heaven on a plate!!! It's my recipe for Pecan Pie from the Pie and Pastry Bible, baked in a tart pan but I discovered I don't have my favorite non-stick Gobel 9 x 1 inch pan so i chose the 1 1/2 inch high one. Cold as it is I just had to photograph it out on the porch with the sun shining on it to show the translucency of the crust. My favorite part is all the textures: the nuts, the crust, the plate, and the table top. The crust is my favorite cream cheese one available on the blog. I now prefer to roll the crust 45 minutes after chilling it as it remains the most malleable. If I'm not ready to roll it I store it in my 65˚F wine cellar. I line the pan, cover it with plastic wrap, and refrigerate it overnight. It has the most perfect shape this way. JEAN QUESTIONFeedback: I live in Mexico and the humidity is very high. I made cream puffs today. They rose up and were beautiful until I took them out of the oven. They fell flat and felt soggy. Is there anything I can do to keep this from happening? ROSE REPLY If you are also at high altitude you will need to decrease the amount of liquid to give more structure to the cream puffs. But for the high humidity it is essential, toward the end of baking after the cream puffs have set, to make a small cut into the side or bottom of each cream puff and then return them to the oven that the moisture can escape. ROSE REPLY: how i loved my visit to adelaide. i would feel sorry for you not having sour cherries except that you have so many other fantastic ingredients we don't have here in america. but someday you must taste them! re the soggy bottom pie crusts: have you tried baking directly on the floor of the oven for the first 20 minutes? i find that helps enormously. for the banana cream pie i would brush the baked pie shell with melted white or dark chocolate that creates an excellent seal for a cream filling. for the fruit pies, if you are concentrating the juices as i recommend and baking on the floor of the oven for the first 20 minutes and still getting a dissolving pie crust i have to question the flour you are using. flour varies significantly from country to country. when i did a demo of strudel at the melbourne tasting australia event, the bakers there recommended a specific flour they knew would work well. it might be a good idea to ask one of the local bakers what flour they would recommend for pie crust. do let me know. i strongly believe that if a bottom pie crust is soggy and thereby not worthy eating it's better to do a top crust only! CINDY QUESTIONFeedback: Would you tell me if there is something to do to prepare a pie crust before baking a pot pie or juicy fruit pie to ensure the crust doesn't remain "doughy"? ROSE REPLY i only use a top crust for that very reason! JERRY QUESTIONFeedback: Why is the bottom piecrust always gummy and the sugar on the top crust won't stick? ROSE REPLY for a detailed answer please see the blog entry on crisp bottom crusts located on the blog under november archives. re sugar sticking to the top crust, you need to brush the dough first with milk or water. Linda Question:Wanting to make raisin pies early for Christmas and not sure if they will freeze. Can you help as I hate to waste anything. Rose Reply: hope this reaches you in time but at least you’ll know for the future: you can freeze unbaked pies and add about 20 minutes to the baking time depending on how deep the filling is. it’s actually an advantage because the bottom crust starts baking before the filling thaws giving it a chance to get crisp and brown. 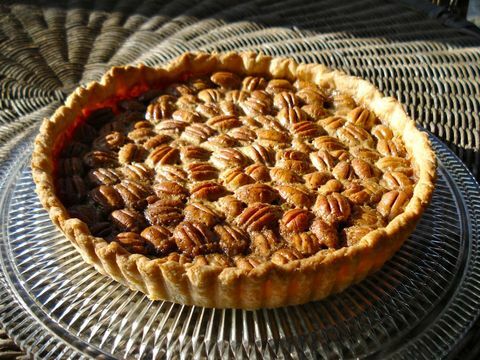 i wouldn’t freeze a baked pie because the dough loses much of its charm and all that remains is the filling and calories! Mark Question:Your Pie and Pastry Bible is my absolute favorite cookbook - quite thorough! I had a problem with the Boulders Tart that I was hoping you could help with. I couldn't get a caramel to form by simply adding the sugar and corn syrup. There simply wasn't enough liquid. I added water to accommodate and it worked fine, but I'm wondering what I'm missing. Thanks again for a wonderful resource! Best, Mark Rose Reply: caramel is made by evaporating the water from the sugar. the more the water evaporates, the higher the temperature of the syrup aned ultimately the deeper the color of the caramel. i like to add a little extra water in the form of corn syrup or water to start the process of melting the sugar more evenly. the cornsyrup also helps to prevent crystallization. if you add extra water it will just take longer for the sugar to start caramelizing but if it works better for you that’s fine. Margaret Question:Help! I have made excellent lemon meringue pies (no, I don't have your pie bible...just the cake book) and yesterday I made a double recipe for my son's 42nd. And it was much to sweet and did not set properly even though I am sure I used the right amount of cornstarch plus flour and cooked over boiling water for at least 20 minutes. Could I have overcooked it? The order lemon juice is added to the egg yolks is different in different recipes. Is there a physical / chemical reaction that could have impacted it's "set-up"? I was abit embarrassed as I am known as a good cook and baker. The meringue was fine and has not "wept" even after 24 hoursl. Rose Reply: lemon meringue is in the top 3 of my favorite pies. i hope it helps to know that the same thing happened to me when i was showing off my new pie plate to my cousins about 6 months ago! this is the first time in many years that this has happened and on thinking about it i realized that a double boiler is NOT a good idea bc cornstarch will not thicken completely until it reaches a boil and a double boiler prevents it from reaching this temperature. i suspect that bc you doubled the recipe and used the double boiler it did not get hot enough. also the lemon juice is best added AFTER thickening as the acidity can prevent the cornstarch from doing it's job! if egg yolks don't reach a temperature of over 140 degrees F the thickening they provide actually reverses itself due to the enzyme amylase in the yolk which attacks the starch unless it's deactivated by adequate heat. whew! make it again soon so you won't be left with a sense of failure. it happens to everyone. baking can be full of surprises. but mostly happy ones! Dustin Question:A friend of mine brought a homemade pumpkin pie to our Thanksgiving dinner this evening, and it had a unappealing gray/green tinge to it. It smelled alright. I did not take a bite, but the other guests said it tasted fine. I just couldn't bring myself to try it. Of course, I whipped out my cookbooks, food chemistry books, and looked Online to see what I could find, but was unsuccessful. Do you have any idea what could have caused this? Thank you! Respectfully Rose Reply: this is a stretch but since this happened to me over 40 years ago i'll share this story/explanation: i was making an angel pie from the old joy of cooking and when i got to the part where it said: ïf you need to know more about egg cookery see page..." i ignored this and used my aluminum saucepan to cook the egg yolk mixture which turned a sort of chartreuse which sounds a bit like the pumpkin pie in question. most people don't have aluminum pans anymore so books don't even warn you about this, but maybe the pumpkin pie filling was mixed in an aluminum pan. find out and get back to us. maybe someone else will have another suggestion as to possible cause! but had i turned to the page suggested i would have read that egg yolk reacts to aluminum causing it to turn an unsightly color. it is for this reason that i put warnings in the cake bible right on the page where the recipe is written so that it can't be ignored! RONI QUESTIONI love to bake and have done so successfully for many years. The one thing I can't seem to do is to get a bottom pie crust to brown. I have used a Pyrex pie pan, a Pampered Chef ceramic pan, a French ceramic pan and a shiny metal pan. I have tried a number of pie crust recipes, too! Please help..Thanksgiving is coming, and I always make an apple pie. Thanks ROSE REPLY i feel strongly that if a bottom pie crust is soggy there is no point in having more than a top crust on the pie! i addressed this in my book "the pastry bible" where i give the technique for juicy pies of letting the fruit sit with the sugar to leach out the juices and then reduce them and return them to the fruit. this way you only need to use about one-third of the thickening agent which results in a more pure fruit taste and you won't be left with a pool of fruit juices on the bottom of a soggy crust after baking the pie. but this alone will not brown the crust. to achieve this, i bake the pie directly on the floor of the oven for the first 20 minutes of baking and then raise it to the bottom shelf. different ovens bake differently so you may need to leave it on the floor of the oven for a longer time. the best way to find out is to use a pyrex plate the first time you do this so you can see through it and gauge when sufficient browning has taken place. if your oven is electric and has coils on the bottom, the best alternative is to use a baking stone on the lowest shelf and preheat the oven for at least 30 minutes to ensure that it is heated fully. i have recently designed and produced a special pie plate that is ceramic with deeply fluted sides to create a beautiful border effortlessly. it also does a great job of even browning of the bottom crust. Rose's Perfect Pie Plate is the first product to be developed and I am very proud of it. It has a deeply scalloped border which effortlessly creates a beautiful crimped crust. Also available is Rose's Sweetheart Crème Brulée.